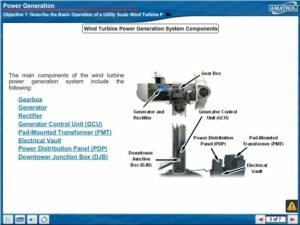 Turbine generator control (GCU) teaches utility scale power generation, system operation, and generator control troubleshooting for large wind turbines. 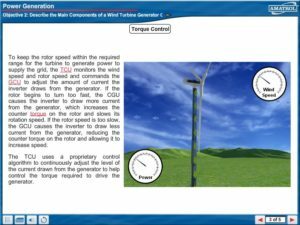 Learners are introduced to a GCU with an emphasis on safety. 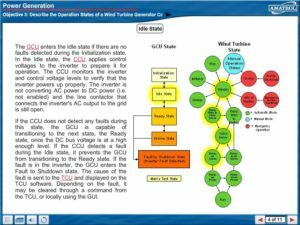 Turbine generator control covers fiber optic communications, typical software used to control a GCU, typical system components like rectifiers, power-on and power-off processes, commissioning tests, and troubleshooting a broad array of possible problems such as operational, line, generator, temperature, and drive faults.